The Six M Galaxy herd of purebred Nubian Dairy Goats was established by the McClure Family in 1973. The breeding program focus is on high milk production, excellent dairy temperament, and strong conformation. In 2014, the Six M Galaxy herd moved from its original home in Sonoma County, California, to the Lorane Valley in Lane County, Oregon. The herd has been on DHIR test since 1974. We have participated in ADGA's Linear Appraisal six times. The herd also participated in the ADGA Classification program, which was the forerunner of Linear Appraisal. Six M Galaxy has been well represented in the Annual National Top Ten lists for milk, butterfat and protein production. In addition to does on test at our farm, many animals we have sold to other herds, and their progeny, have also earned Top Ten status in those other herds. During the Great Recession, we sold all our goats. We leased back the two oldest does and youngest buck so we weren't without goats but knew they were assured a safe place to go if necessary. We continued with DHIR during that time. Since moving to Oregon, we have re-established our herd. We are deeply grateful to the breeders and friends who have helped us reclaim our genetics so we can continue to work with the Six M Galaxy line. 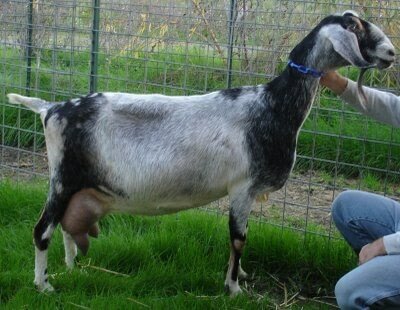 Many of the goats we are working with bring with them out-cross genetics that we are happy to add to the genetic mix. The Six M Galaxy herd is completely G6S normal. In 2001 our entire herd tested normal. The goats we have acquired since moving to Oregon are all G6S normal by test or pedigree. We are CAE negative and have never had a CL abscess.